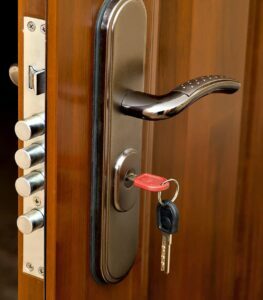 We take care of all your residential locksmith needs. When you first move into a new house it is a great idea to perform a check of the locks and any other security system that come with the property. Changing the keys that open external doors, gates, garages and other entry points will ensure that no previous owners can gain access. You have the options of changing locks or rekeying the locks, for a cheaper alternative. We can provide a security check on your premises for you, but we suggest you conduct a quick scan yourself. Have a look for any entry points into your new residence that do not have locks on them – check all windows, sliding doors, gates, basement access, etc. We can install locks to secure any opening and prevent unauthorised access into your home and property. If your home has a security system currently installed, we are able to reconfigure it, ensuring access has been removed from previous owners. We will provide a thorough review of the system to check for any weak points. If needed and upon your approval, we can update PIR and other sensors, access points, main consoles, CCTV cameras, intercoms, and other system parts and components. Today’s security systems provide you with high levels of control and surveillance and prove themselves very reliable security measures for your home, valuables and your family. Speak with one of our residential locksmiths now to make sure that you have a suitable security system to meet your needs. Check out or other mobile locksmith services.